Arthralgia is shoulder joint pain (or any other joint) where arthritis is inflammation within the joint. Acute inflammatory joint lesions may occur and show any characteristic of inflammation. Possible signs could be pain (may be throbbing), redness, swelling, local heat in the shoulder joint and a loss of functional movement of the shoulder. Generally, cartilage problems affect the knee joint but can affect other joints. It is due to weight bearing and twisting motions which destroy the cartilage within the joint. The shoulder joint pain will be aggravated by movement and may have sudden joint lock due to flakes of cartilage within the joint. Generally may cause arthritis which is unilateral with redness, swelling, heat around the joint and irritated or burning pain of the shoulder. Restriction of any joint may be caused by mechanical defects, soft tissue contractures, joint effusion, muscle pain, muscle spasms or muscle paralysis. This occurs when all opposition between the ball and socket joint and the muscles/ligaments is lost allowing a subluxation of the joint. Damage to the shoulder joint capsule will cause pain which is aggravated by movement which places the effected part of the capsule under tension. Shoulder Joint effusions may occur. There may be a joint effusion causing excess synovial fluid within the shoulder joint. Firm palpation with a finger will reveal a boggy feeling of the shoulder. There may be displacement of the fluid which causes extra swelling to develop in proximal areas to the shoulder. This can be detected by a clear sense of fluctuation between two palpating fingers. Joint swelling may also be caused by pus or haemorrhage within the shoulder. This type of shoulder joint pain will give rise to tenderness over the acromioclavicular joint, especially when the arm is brought in front and across the chest (adduction). This joint pain suggests arthritis in the acromion and calvicular joint. The pain will often be aggravated with a shrugging movement of the shoulders. This may be due to direct trauma to the shoulder girdle. Tenderness over the long head of the biceps where a groove can be felt. When pressure is added to this groove general pain will be felt. Shoulder pain will also be felt when the shoulder is flexed and the arm is supinated against resistance. Shoulder joint pain originating over the rotator cuff when the elbow is passively lifted posteriorly or with a "dropped arm" maneuver. If pain occurs with this type of shoulder movements, it generally points at tendonitis of the rotator cuff. This type of shoulder pain is common after the age of 50 but is found in all ages. The shoulder pain begins with localized supraspinatus tendonitis, extending to other rotator cuff tendons insertions and subacromial bursa. This type of shoulder disorder may lead to a frozen shoulder from adhesive capsulitis. Adhesive capsulitis arises from impingement of the rotator cuff against the undersurface of the acromion and coracromial ligament. 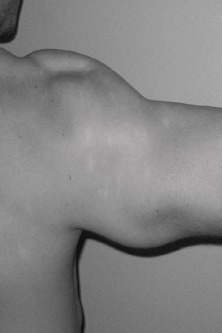 This condition leads to inflammation and degeneration of the shoulder muscles and tendons. This type of shoulder joint pain will radiate anterior and superior to the aspect of the shoulder and be greatly aggravated when the arm is raised overhead. This pain suggests subacromial bursitis. There may also be shoulder joint pain and tenderness anterolateal to the acromion, in the hollow recess formed by the acromiohumeral sulcas. This type of pain is generally due to overuse from repetitive motion like throwing a ball in base ball or swimming. The joint pain is caused by impingement of the acromion, acromioclavicular ligament and coracoid process against the underlying bursa. This will result in inflammation of the burs giving rise to shoulder pain in and around the joint.